Like many, I often spend my sailing holidays far away from home, assuming that real adventure requires some kind of international flight. More and more, though, I’m learning that some of the best sailing vacations can be found right in my own backyard. Eternalized in the short stories of Ernest Hemingway, the country around Traverse Bay is also legendary in its rustic wild beauty. Of course, a lot has changed since Hemingway’s parents built a cottage in the woods near Petoskey. Back in those days, the woods were full of Ojibwe Indians, bootleggers and lumberjacks, and the wildlife was rich and plentiful, especially the trout. In fact, it was the 20-odd summers Hemingway spent there as a boy and young man that gave him his love for hunting and fishing. In spite of the march of time, the lands and waters here are still some of the cleanest, wildest and most beautiful you can find east of the Rockies. 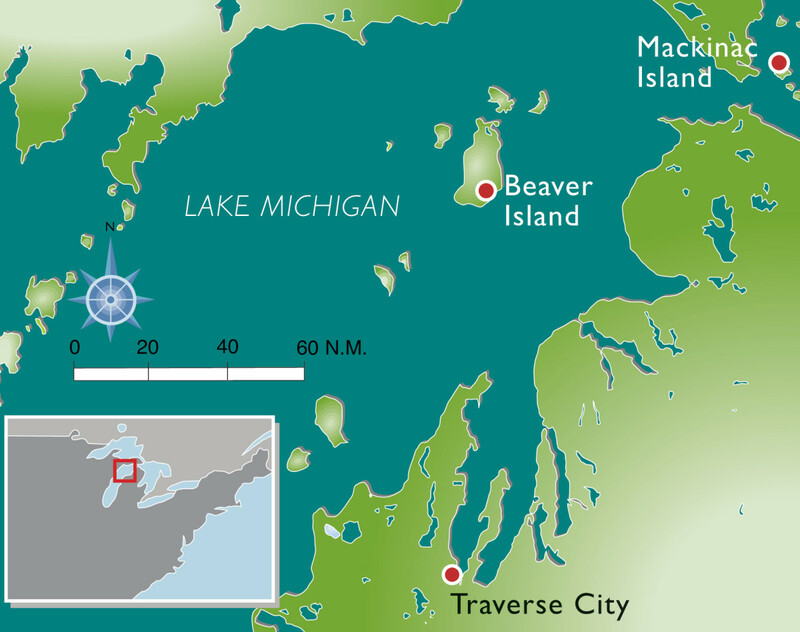 And as you head north, it only gets wilder, as we would soon learn at one of our last anchorages, Beaver Island. This was my first time sailing on Lake Michigan, and I was truly amazed by the magical colors of the waters here. I was expecting rather gray-brown lake water, but instead, I was treated to shades of sapphire, turquoise and cerulean blue that I would more expect to see in the Caribbean. It allegedly has something to do with white quartz in the sediment here. Whatever the reason, it’s absolutely lovely. That said, the nice thing about Traverse Bay is that while it’s fairly large it is still well protected from the heavy stuff, so it provides a few days to get acclimated. Depending on the wind direction, there are also lot of choices of fun anchorages, most of which have quaint little towns to visit, each with a nice selection of restaurants and shops. As you’re heading out of Traverse City, your first stop should be one of the bays along Mission Peninsula. This little tongue of land is replete with incredible wineries. The tradition started generations ago with emigrants who mostly produced Rieslings, in part due to the short growing season, and also due to the fact that many of these pioneers were of German descent. More recently the wine scene has literally exploded with new vintners opening yearly, and with those new wineries have come many new varietals, including delicious Pinot Noirs, Pinot Grigios, Chardonnays and Cab-Francs. Many of the wineries also incorporate amazing and exotic food parings with their wine selections, so bring your appetite along on the tour. One winery I was especially impressed with was Bonobo Wineries, where I had the pleasure of meeting Todd Oosterhouse, a Traverse City native and one of the two brothers who started the business. Todd is not only passionate and devoted to the land he calls home, but also to the art of making wine, which you can taste in each of his offerings. After feasting on local grapes and grub, my buddy and I headed over to the west side of Traverse Bay, where we found a great anchorage southeast of Suttons Bay Marina. Here you’ll find a beautiful long sandy beach that’s great for swimming/sunbathing and easy to access via dinghy. Our goal in Sutton’s Bay was to visit the Hop Lot Brewing Company—a unique outdoor/indoor bar restaurant/brewery that (as one might expect) has an amazing beer selection. It’s a short walk from the anchorage, and they regularly have live music. 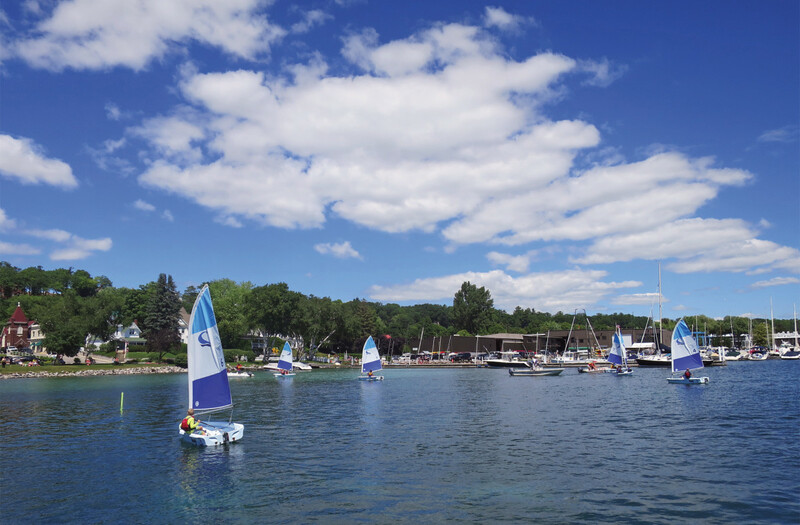 Sailing north from Traverse Bay, there are two towns that are on almost every cruiser’s list: Harbor Springs and Charlevoix. 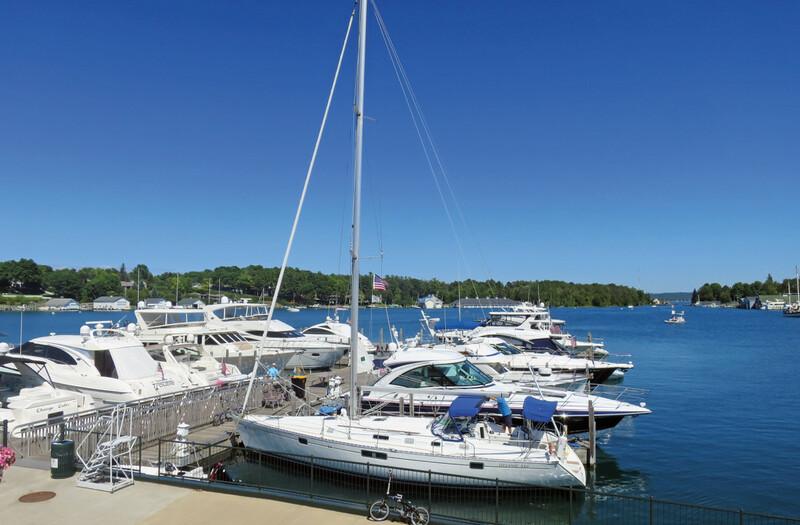 The feel in both these towns is quite a bit different from what you find in the small villages along Traverse Bay: especially Harbor Springs, which is upscale and very popular during the summer with boaters and landlubbers alike. If you like shopping and a wide selection of eclectic eateries, this place should be on your itinerary. 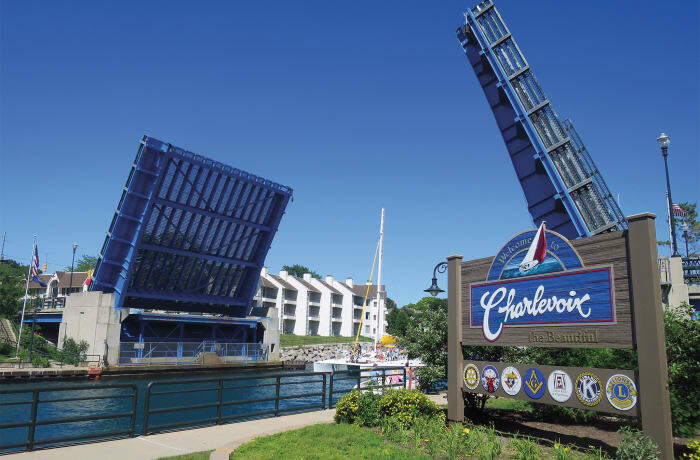 Charlevoix is also a big tourist destination, but a little more relaxed. A channel cuts the town in half and leads into a wonderful little body of water known as Round Pond, which is well protected and has great anchoring. If that anchorage is full, you can continue on to Lake Charlevoix. This is the third largest lake in Michigan, so you’re sure to find a spot to drop a hook. For those with a lot of time on their hands, Lake Charlevoix is an adventure in and of itself, with 56 miles of beautiful shoreline to explore. More protected than the “big lake,” it’s also a good option if weather comes in and Michigan gets too wild. If you want to poke around Hemingway’s old stomping grounds, Petoskey is just east of Charlevoix and right across from Harbor Springs. 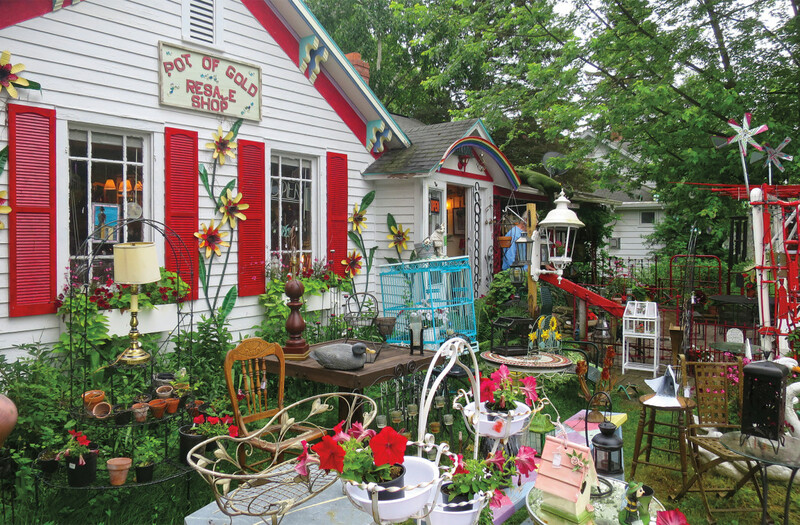 Unlike the other two towns in this part of the state, Petoskey has much more of a local feel and is a convenient place to provision, as the prices are a bit more reasonable than you’re likely to find in the more touristy spots. It also has a great sporting goods store just up from the marina if you’ve lost your sunglasses or are looking for fishing tackle. As it was, we ended up stopping in Petoskey for two reasons: I wanted to breathe the air where Hemingway spent his childhood summers; and in the spirit of “Papa”(Hemingway’s nickname) I wanted to buy a few local lures in the hopes of catching some of Lake Michigan’s enormous lake trout. While poking around, I also happened to ask the sales clerk what he thought of Beaver Island, as we were thinking of heading there next. He paused, got a kind of mischievous twinkle in his eye and said if we were looking for “real” Michigan we’d find it there. I wasn’t exactly sure what he meant by “real” Michigan, and he didn’t elaborate, but needless to say, it piqued my interest. It’s a bit of a haul getting up to Beaver Island, so you have to be committed to this kind of adventure, and we were. Also, you’re in a large exposed part of the lake, so be prepared for some good wind and waves if the weather picks up, like it did for us. In fact, we came into Beaver Island pretty hot, with the weather to come looking even bigger and badder, so we skipped anchoring and headed into the public marina, the Beaver Island Municipal Dock. This is an awesome and affordable little marina that has coffee and doughnuts in the morning and also a washer and dryer—who could ask for anything more? Just as the sporting goods story clerk had suggested, Beaver Island is anything but a tourist Mecca, and “local” in every sense of the word: no big surprise given how isolated it is up in the very north of the lake, a good 30 nautical miles from the mainland. The only way to get there is via a ferry that runs a couple of times a day from Charlevoix or by light aircraft. In the winter, when the lake freezes, the ferry stops running, and the only way in is by plane. During those long dark months, most locals stock up and stay put. Given how quiet and low-key Beaver Island appeared on arrival, we figured we’d only stay one night. But that all changed after we hit the local bar for a beer and some food. As one might expect, there weren’t a lot of choices for dinner—the folks at the marina only offered up one suggestion, Stoney Acres Bar. It was within walking distance, though, so we headed off into the night. Predictably, the storm that chased us in dumped some serious rain on us midway into our walk, and we’d left our rain gear on the boat. That’s when we received our first introduction to Beaver Island’s amazing hospitality—the very first car that passed us stopped and offered us a ride. We were a bit wet and the car was already packed, so we hesitated, not wanting to impose. The driver, though, would not take “no” for an answer and told us there was plenty of room. Sure enough, everyone scooted over and we squeezed in. At Stoney’s, we took a seat at the end of the bar. Since we&apos;re clearly the only non-locals there, we tried to maintain a low profile. Nothing doing! Two minutes after we sat down, a couple joined us, introduced themselves and asked us where we were from. Then a couple of more folks came over, and so on and so on, until we got to know most of the people there. When we got ready to go, our new friends not only offered to give us a ride back to our boat, but also invited us to go “boodling” with them the following afternoon. As one might expect, we ran into some other boodlers, and the whole thing felt like an island party. I know all of this might sound bizarre, but it was a total gas. We were also mostly bumping along at under 15 miles an hour on dirt roads, so it was not too dangerous—and traffic on Beaver Island is minimal at best. When we woke up the following morning the storm was still sitting on the island, but we had no problem spending another night on Beaver Island. And though we were boodled out, one of the folks we’d met who worked at the marina let us borrow her car to explore the island, so we visited a number of gorgeous pristine lakes and some very beautiful beaches and hiking trails. There is also a rental place, Happy Paddle, which rents bicycles, kayaks and stand-up paddleboards. Another attraction is Beaver Island Head Light. Located high on a bluff on the southern tip of the island, it was erected to help boats safely pass between Beaver Island and Gray’s Reef. Built-in 1858 to replace an older light, the 46ft tower and decagonal lantern room offer wonderful views of the lake. By now our charter time was sadly running out, so the next morning we said goodbye to Beaver Island and set out to brave the big winds that were waiting for us just outside the shelter of the harbor. Happily, we had 25 knots of wind on the beam, giving us a fast but safe rocket-ship ride back to the shelter of Traverse Bay. The sun was dipping low in the horizon on our arrival, so we spent our last night in Northport, which turned out to be another beautiful little lakeside town steeped in good-old Michigan charm. At this point, my buddy had to head home, but I had a little extra time and so had booked a couple of nights on Mackinac Island. It was a wonderful drive from Traverse through Michigan’s North Country, and I stopped a couple of times to try my luck at fly fishing (more of the old Hemingway reminiscing). Alas, my luck wasn’t as good as Papa’s back when these rivers were teeming with fish. Still, I got to see some beautiful country, which made these little diversions worth the time. My reason for visiting Mackinac Island was a combination of curiosity and my passion for classic hotels. Mackinac’s Grand Hotel, with its enormous sweeping porch, is one of the most famous in the country. You might remember it from that famous film with Christopher Reeve called Somewhere in Time. The island is one of the most popular destinations on Lake Michigan and gets pretty crowded in the summer months. However, there’s a fantastic round-the-island walk that takes you far away from the hustle and bustle and provides amazing vistas and space to relax and take it all in. I recommend renting a bicycle unless you really like to walk since this path is quite long as it circles the island. My stay at the Grand Hotel also happened to coincide with the finish of the Chicago-Mackinac race, and I chatted with a few racers at the after-party bash, as the “dark and stormies” helped them get their land legs back. As I did so, and in spite of the charms of the Grand Hotel, gazing out over the waters of Lake Michigan only made me want to get back out on them as soon as I could. In short, I’d discovered a whole new cruising ground—the Great Lakes! My next trip: Lake Huron!